Aaron Rodgers throws a pass. Quarterback Aaron Rodgers of the Green Bay Packers celebrates. Last year, with quarterback Aaron Rodgers missing half the season due to a broken collarbone, the Packers finished with just an 8-7-1 record, and gave up more points than they scored. 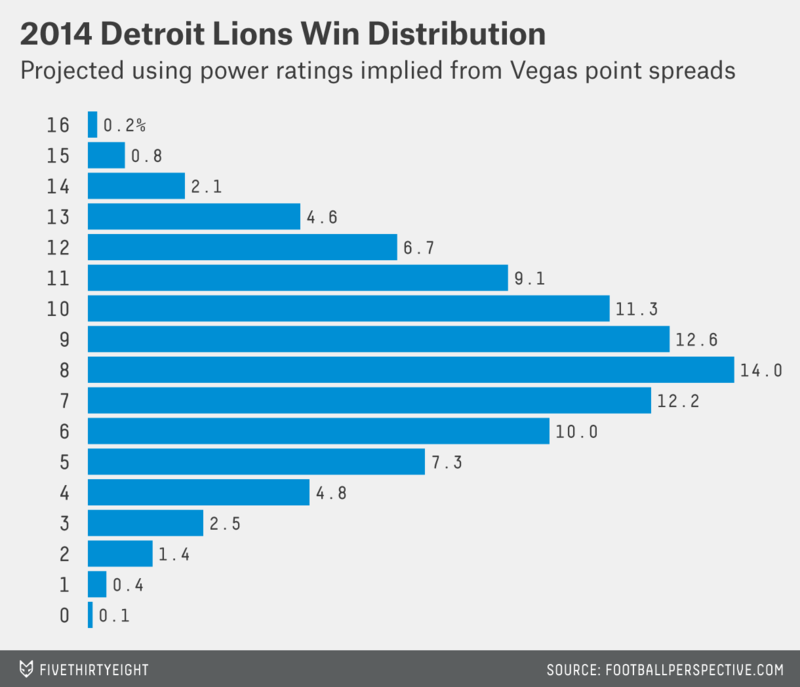 Despite all that, they still eked out an NFC North division championship for the third year in a row. 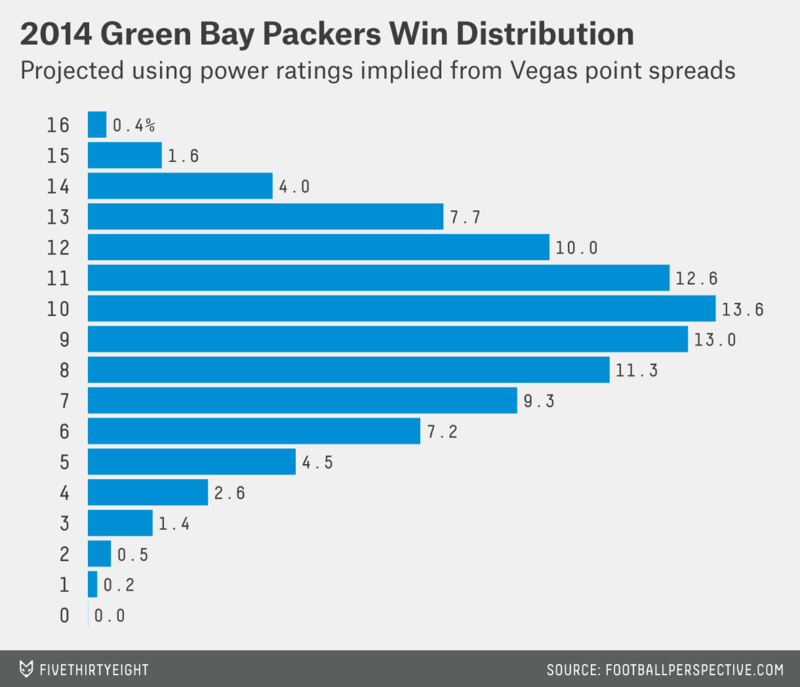 Since Rodgers took over for Brett Favre in 2008, the Packers have been one of the NFL’s best franchises. They’ve won the fourth-most games (they’re in essentially a four-way-tie behind the Patriots) and a Super Bowl (as many of those as anyone else over that period, and one more than the Patriots). ESPN’s Total Quarterback Rating (QBR) is one of the most all-encompassing quarterback rating systems out there today.3 Rodgers’s QBR in the last six years is 72.9, second only to Peyton Manning’s 80.7. Rodgers performs fantastically well in a variety of other quarterback metrics. 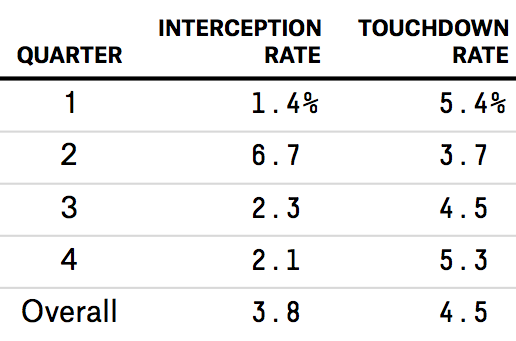 Interceptions are often (even largely) a product of completely rational risk-taking by desperate quarterbacks. A logical implication of this is that if a quarterback is too conservative, he can throw too few interceptions, which can be just as bad as throwing too many. Being insufficiently willing to gamble even when circumstances are dire can be good for a QB’s stats, while bad for his team. And there’s evidence of this in Rodgers’s record as well: He has only engineered six fourth-quarter comebacks in his career — good for 149th all time (Russell Wilson already has eight). There’s nothing wrong with giving your team the lead and then keeping it.6 But Rodgers has averaged one fourth-quarter comeback every 14.5 games. This is staggeringly low, even for a player whose team isn’t behind that often. Brady has played for an even more consistently good team and has a fourth-quarter comeback once every 6.2 games. Both brothers Manning have averaged one every six games, Ben Roethlisberger has one every 6.2, Drew Brees and Joe Flacco have one about every eight. Favre (surprisingly) had one only every 9.9 games. But the good news for Packers fans is that Rodgers has some pretty low-hanging room for improvement: If he starts taking more calculated risks (likely sacrificing his stats a little in the process), the Pack may be even more dangerous. Last season, the Chicago Bears finished 8-8, fitting for a team with one of the best offenses (not led by Peyton Manning) and one of the worst defenses in football. That’s a good excuse to talk about their special teams. For as yet unknown reasons, Chicago let its best player7 go. This includes a record 13 touchdowns (the previous career record for any punt returner was 10). Hester also has five touchdowns from kickoff returns (good for eighth on the all-time list9) and is looking to break his present tie with Deion Sanders for most non-offensive touchdowns in NFL history. Kick and punt returns normally aren’t a big enough part of the game for a good returner to produce much value unless he also does other things well. But Hester is so insanely good he may be as close to an exception as you’ll ever see. Since 2006, when Hester joined the team, Chicago has had the highest number of yards per punt return, resulting in the best average starting position, and has scored a touchdown on one of every 21 returns. The average for teams other than Chicago was one TD every 82 punt returns. And that’s not even counting all the times other teams punted short or out of bounds to avoid a return. 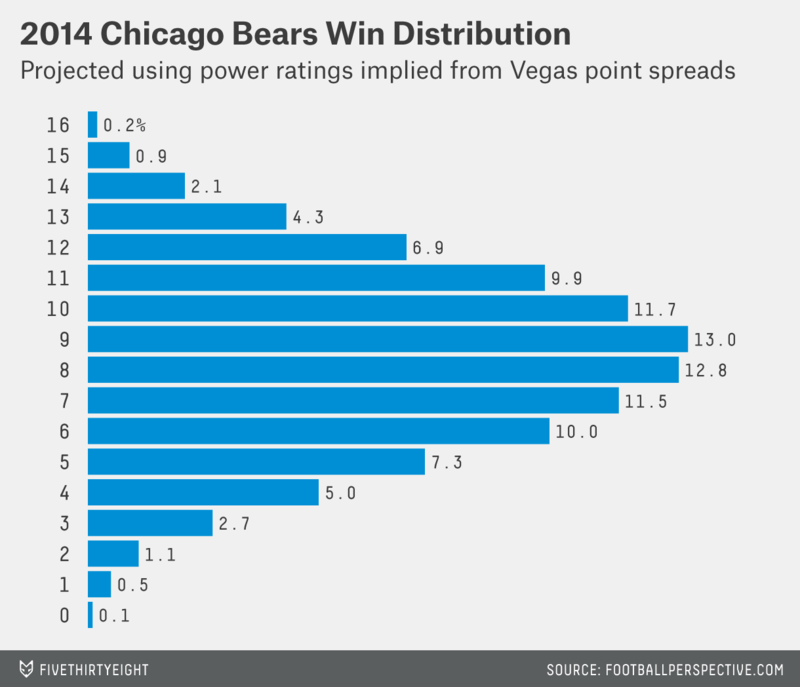 According to ESPN’s “expected points added” metric, Chicago’s punt return game was worth about .15 expected points over expectation for each of the 668 punts they faced, or about .80 points per game total. Combining this .80 with the .20 Hester gained returning kickoffs, he was probably worth around 1 point per game overall. We’re obviously not talking Aaron Rodgers-type value here. But football is a 46-on-46 sport: It’s hard for any one player (aside from a quarterback) to matter much. A reliable 1 point per game is pretty significant. Chicago had an average margin of -2.1 points per game last year, so with Hester’s departure, let’s say the team is starting out in a 3-point hole. If the offense gets worse or the defense gets better, it could go either way from there. According to that article, Stafford “must cut down on his crucial mistakes when it’s make-or-break time.” Presumably, this refers to the six fourth-quarter interceptions Stafford threw in one-score games last year. With his team down 2+ scores, his interception rate is 2.5 percent. If anything, this may be too low. With his team down one score or less, his interception rate is 2.8 percent. This is probably just about right. With the game tied, his interception rate is 2.2 percent, which is below average. With his team up 2+ scores, his interception rate is about 3 percent, which is a little high, but not necessarily a problem considering the sample size. With his team up one score or less, his interception rate is pretty high: 3.8 percent overall and a whopping 6.7 percent in the second quarter. In other words, if there’s one spot where Stafford has been making an unusually high number of mistakes it hasn’t been “make-or-break time,” it has been earlier in the game, when his team is up one or fewer scores and most QBs would play it safe (league average interception rate is around 2.3 percent under those circumstances). Of course, while throwing interceptions with your team up one score isn’t generally wise, it could be worth it if it’s helping you gain a ton of touchdowns. Indeed, Stafford throws a good number of TDs in these situations. While that 4.5 percent is good, it’s only 0.5 percentage points better than average — in other words, it’s not a very good trade-off considering his interception rate under these circumstances is 1.5 percentage points higher than average. To generalize a bit, you can think of the sum of a player’s touchdown rate and interception rate as his “aggression level.” Stafford is a fairly aggressive quarterback overall, but his aggression level while ahead by one score or less in the second quarter is 10.4 percent, which is off the charts compared to the league average of 6.8 percent. This isn’t really the best time to get aggressive, and it isn’t really working for him. Adrian Peterson now has more than 10,000 yards rushing and 91 touchdowns in his seven-year career, giving him over 2,000 more yards and 24 more touchdowns than anyone in the last seven years. 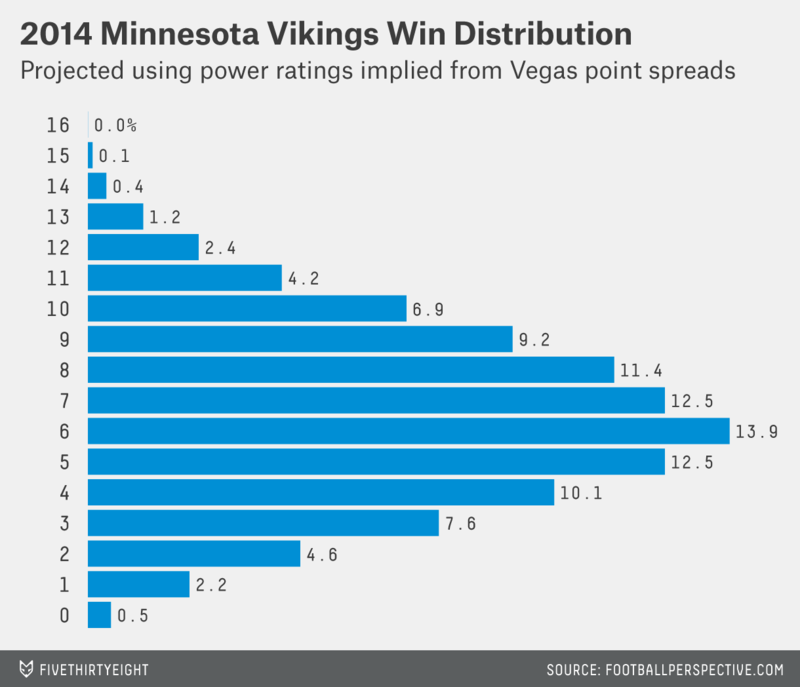 Yet the Vikings finished 5-10-1 last year, their third 10-loss season in four years. They haven’t had a top-10 offense since Brett Favre’s miracle year, nor before that since the Randy Moss era. The threat of the running game forces defenses to defend multiple strategies, which makes the passing game more efficient. It’s low-risk and eats up the clock: A team that is ahead may be willing to give up a small amount of per-play value in order to shorten the remainder of the game and decrease the chances of a costly turnover. Runs gain positive yards more consistently than passes, which can be useful in a number of ways beyond average yardage. For example, very good running backs (or running games) set up a higher number of second-and-short situations than passes do, and these can be better than first downs. Of course for Nos. 1 and 2 to work most efficiently, you have to run effectively. And running effectively mostly means No. 3. While Peterson breaks a larger share of long runs than typical running backs, he is neither a consistent gainer nor a producer of high-leverage situations. 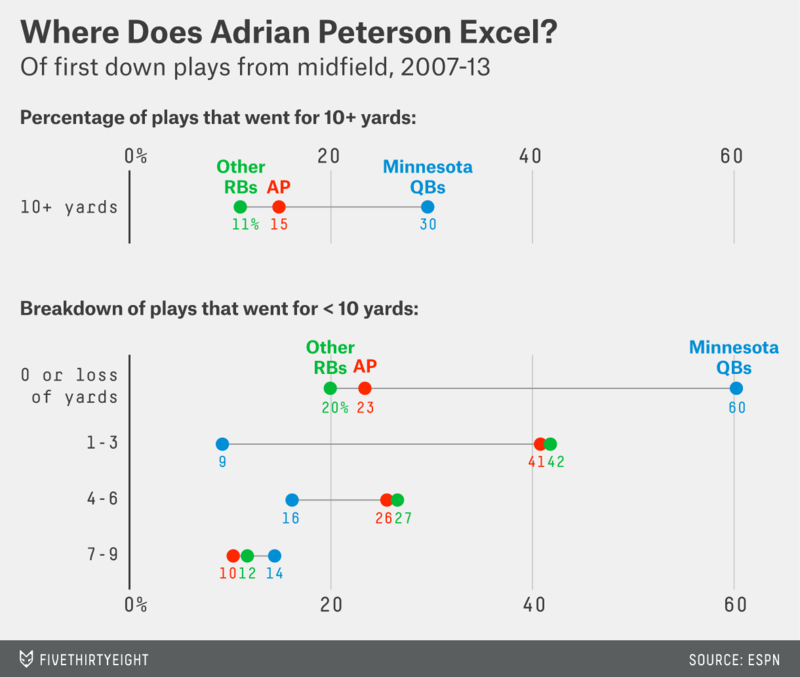 Obviously Adrian Peterson’s long runs are worth something: They’re worth a lot of yards. But yards are easier than ever to come by in today’s game. No matter how great a running back is at breaking long ones, he’s not going to be as efficient at gobbling up yards as his team’s passing game is (no matter how mediocre the team’s quarterbacks are). On the other hand, the better a team is at strategically maximizing the running game, the more valuable those “bonus” yards become — because the running plays that produce them are no longer taking the place of passes. In other words, if you can’t run consistently, it doesn’t matter if you can break a bunch of long runs, because you’d still be better off passing. But if you can run consistently, those long runs become gravy. None of this is to say that Peterson’s shortcomings necessarily reflect poorly on his running skills, no more than we can say the same for any running back’s underperformance. Peterson has simply produced a little below average at the bread-and-butter stuff that keeps the running game relevant, and this undercuts the value of his long runs considerably. With a better offensive line, or quarterback, Peterson’s value would improve doubly. Matt Flynn, Scott Tolzien and Seneca Wallace all started games in Rodgers’s absence. Note this isn’t necessarily a compliment. In a phenomenon I like to call “The Paradox of Quarterback Metrics,” beyond a certain point, the more information a QB metric takes into account, the less it tends to tell you about the quarterback. Being ahead or behind one score is 0-8 points, two scores is 9-16 points, three scores is 17+ points. Based on play-by-play from 2001 through 2013. I vividly but hazily recall this being Troy Aikman’s response when someone asked him about his lack of fourth-quarter comebacks back in the ’90s — and he had one about every 10 games. 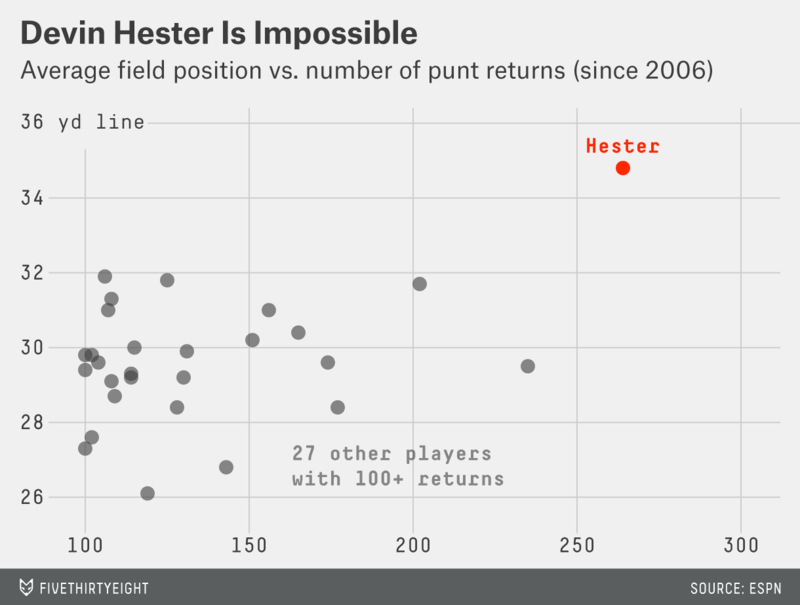 Some of that field position is no doubt due to Hester’s reputation and the fact that teams went to great lengths trying to avoid kicking him the ball — so he probably grabbed the ball in better positions. But the average Chicago field position from a non-Hester return was around the 30 yard line. And the fact that Hester was able to take so many returns and still do so much with them is remarkable in its own right. Despite playing for a good defensive team for much of his career and not even returning kicks full-time for parts of it. Actually it’s .204 points per game, compared to .208 if you estimate the value of additional field position directly. Giving Hester credit for Chicago’s entire return game is neither an aggressive nor a conservative assumption. If the rest of the special teams squad was below average, it’s possible that Hester provided even more value than the squad as a whole. Also known as the best time to throw interceptions.